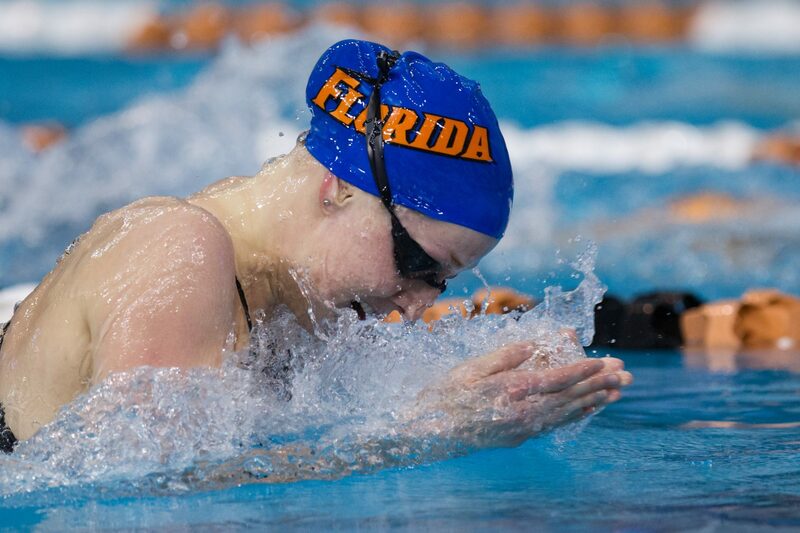 Hrafnhildur Luthersdottir, known as “Hilda” in her college years with the University of Florida, took the women’s record, going 2:13.83 for the easy win. That is just under four seconds faster than the old record, with Luthersdottir already held. Her Icelandic countrywoman Johanna Gustafsdottir was second at 2:18.14. Iceland, hosting the meet in Reykjavik Tuesday through Friday, had a solid night across the boards, led by this 1-2 finish. Meanwhile in the men’s race, Raphael Stacchiotti crushed his own meet record, too, going 2:00.18. That’s over four seconds quicker than the previous meet record, which Luxembourg’s Stacchiotti already held. That also shaved a tenth off his own national record. Iceland’s Anton McKee was second with a 1:04.53. Luxembourg took down another meet record in the women’s 100 free. That came courtesy of 17-year-old Julie Meynen. Meynen, the national record-holder in the event as a junior swimmer, was 55.66 for the win, breaking the old meet record of 55.97. She was just four tenths off her own Luxembourgish record. The final meet record came in the men’s 200 fly, where Luxembourg’s Laurent Carnol was 2:02.93, taking just over half a second off the meet record and touching out Liechtenstein’s Christoph Meier for the win. Luxembourg’s Julien Henx and Jean-Francois Schneiders also won events. Henx took home the men’s 100 free in 50.39, a big win that came by over a second. Schneiders took the 200 back in 2:05.41, though he was well off his meet record of 2:01.71. The women’s 200 back went to Eyglo Gustafdottir out of Iceland in 2:12.59, a winning margin of over six seconds. Second was Johanna Gustafsdottir, who was also second in that 200 IM later in the night. Julia Hassler won the women’s 200 fly for Liechtenstein, going 2:16.38 but missing her meet record by four tenths. Isn’t that a Icelandic record for Hilda Luthersdottir in the 200IM?